Want an event at M&E? Two Old Women is based on an Athabascan Indian Legend from the upper Yukon River Valley in Alaska. This is the legend of two old women who were abandoned by their tribe in the middle of a desolate winter to die in the cold Alaskan wilderness. The tribe felt the women were slowing The People down in their journey to a new camp. Left to their own devices this is the story of how two women, betrayed by their family and friends and left in the wilderness to die, decide to live instead. Aged 80 and 75 years old, Ch'idzigyaak and Sa' realize that they may still have the power to survive and do. This legend is a parable for not only respecting the wisdom of your elders but also for elders to respect the young and themselves. Sa' says it perfectly, "Yes, in their own way they have condemned us to die! They think that we are too old and useless. They forget that we, too, have earned the right to live! So I say if we are going to die, my friend, let us die trying, not sitting." It's quick and worth it, read it. 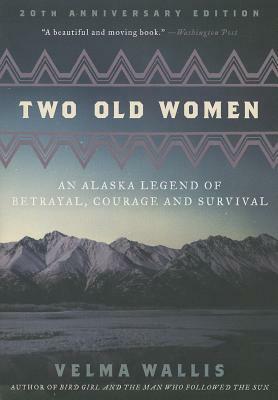 Based on an Athabascan Indian legend passed along for many generations from mothers to daughters of the upper Yukon River Valley in Alaska, this is the suspenseful, shocking, ultimately inspirational tale of two old women abandoned by their tribe during a brutal winter famine. Though these women have been known to complain more than contribute, they now must either survive on their own or die trying. In simple but vivid detail, Velma Wallis depicts a landscape and way of life that are at once merciless and starkly beautiful. In her old women, she has created two heroines of steely determination whose story of betrayal, friendship, community, and forgiveness "speaks straight to the heart with clarity, sweetness, and wisdom" (Ursula K. Le Guin). Velma Wallis is one in a family of thirteen children, all born in the vast fur-trapping country of Fort Yukon, Alaska, and raised with traditional Athabascan values. A writer and avid reader, she lives in Fairbanks.